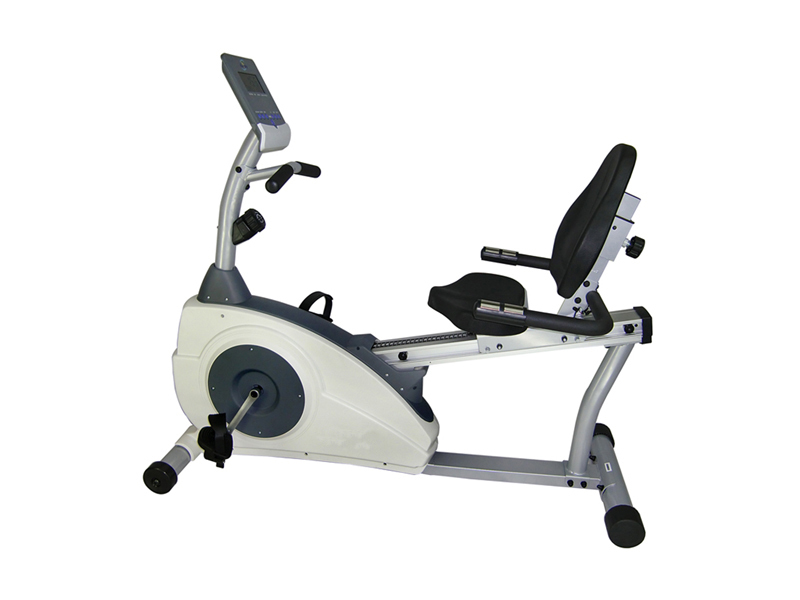 SunSai Fitness We are among the leading Fitness Equipment Manufacturers and Importers of Commercial Cardio Fitness Equipment in India. 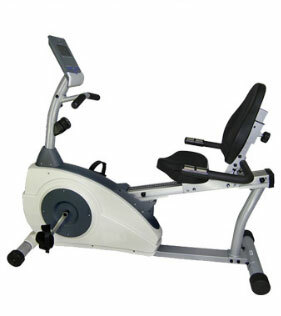 The wide range of Cardio Exercise Fitness Equipment include Motorized Treadmill, Recumbent Bike, Upright Bike, Treadmill, Exercise Cycle, Elliptical, Cross Trainer and many more. 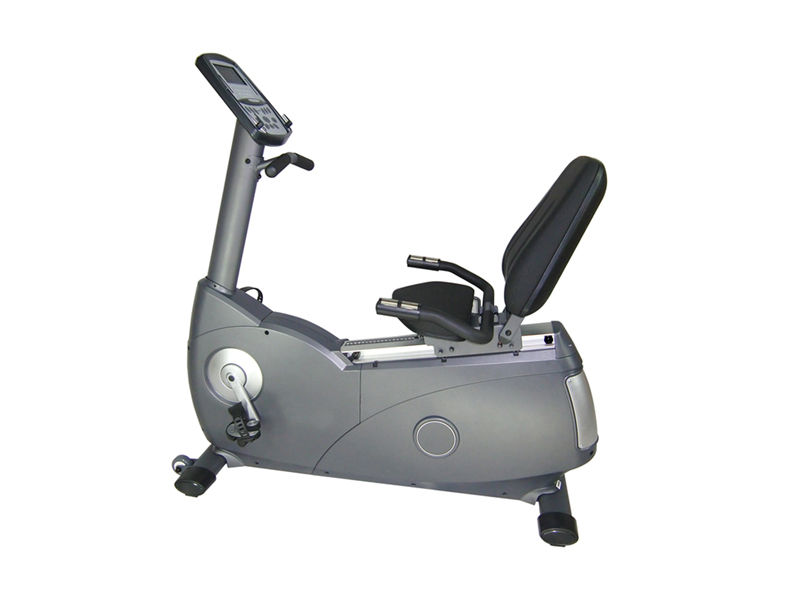 Recumbent Bike is mainly use for Cardio Workout and Weight Loss Fitness Exercise, This is the best Cardio Fitness Machine for Cardio Exercise. Model No. 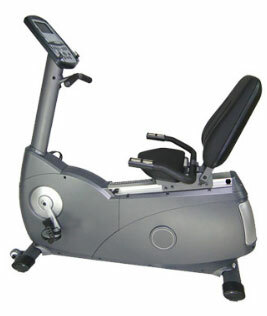 FRB5000 Recumbent Bike . Programs: 06 programs – Goal, HRC, watt, P1, P2 & Test. Fly wheel: 20 Kg, Precision Balanced. Pedals: Self Balanced extra wide paddles with adjustable straps. Seat: Ergonomically designed comfortable seat with flex back cushion contoured for lumbar support with 20 levels seat easy slide adjustment. Cardio Monitor: In built hand grip pulse sensor provided with hand grips enables to the cardio monitoring on board. Display: Dot matrix large LED with scrolling text, computerized console. Display Feedback: Multi feedback read out instantly displays time, distance, RPM, Calories, Pulse, Watt, and Level. 17. Accessory Holder: Book holder on the upper case of consol. Water bottle & mobile phone holder. Model No. 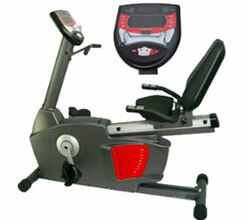 FRB5100 Commercial Recumbent Bike . Power: 9 Volt DC adapter for self-powered convenience. Programs: 21 programs – 12 Preset, 1 Manual, 1 HRC, 1 Personal, 1 Body Fat, 1 to 4 Users & Watt. Pedals:Self Balanced extra wide paddles with adjustable straps fit to any size user. close Spacing, & shock absorbing air cushion, provides gentle movements. Seat:Ergonomically designed comfortable seat with flex back cushion contoured for lumbar support with 27 levels seat easy slide adjustment. Handle Bars:T-Bar Style at console and rear handle bar with contact heart rate sensor. Centre of Gravity:Low COG combined with a balanced frame prevents rocking. 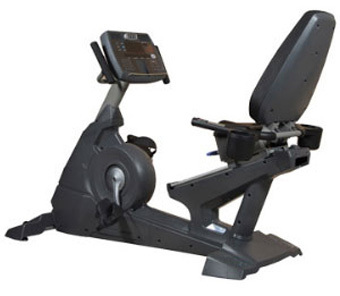 Cardio Monitor:In built hand grip pulse sensor provided with rear handle bar grips enables to the cardio monitoring on board. Display:LCD with blue back light scrolling text, computerized console. Display Feedback: Multi feedback read out instantly displays time, distance, RPM, Calories, Pulse Speed resistance level, Watt, Personal. User Weight: 120 kgs. Transportation: Transportation wheel for easy movement. Power: 9 Volt DC adapter for self-powered convenience. Programs: 21 programs – 12 Preset, 1 Manual, 1 HRC, 1 Personal, 1 Body Fat, 1 to 4 Users & Watt. Power : 3 Volt dry batteries. Pedals : Self Balanced extra wide paddles with adjustable straps fit to any size user. Close Spacing, & shock absorbing air cushion, provides gentle movements. Seat : Ergonomically designed comfortable seat with flex back cushion contoured for lumbar support with 28 levels seat easy slide adjustment. Handle Bars : T-Bar Style at console and rear handle bar with contact heart rate sensor. Cardio Monitor : In built hand grip pulse sensor provided with rear handle bar grips enables to the cardio monitoring on board. 13. Clock User Weight : 120 kgs.